Digital Planet was a recent exhibition which toured the UK in 2012. It was a digital inclusion initiative which firstly showcased the power of the internet through an outside photography gallery. Secondly, it also provided personal and tailored support for locals who were interested in the internet and wanted help with their own digital literacy. 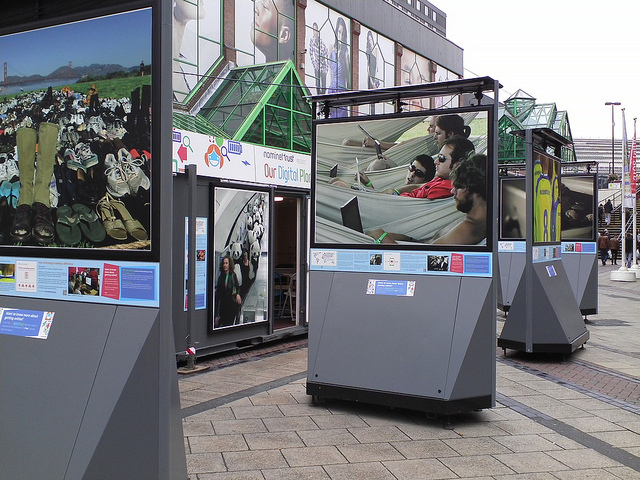 For many of the citizens who engaged with the exhibition it provided a non-judgmental, and safe environment to learn about their online technology options, as the video below shows with the story of Bristol resident Ron, the internet is by no means a normal part of some peoples life’s. I think what makes this initiative so valuable is that it engages and values the individual. Furthermore as a traveling exhibition it helped stimulate conversations within specific communities and addressed the digital exclusion issues relevant to them. Stories such as the example of Ron’s highlight how for some people, internet technology is a field of which they know very little about. This is understandable given that computers were not introduced in schools in the UK until the mid 80’s, and ICT was not introduced as a subject until the 1990’s. Ron is 84. What is frightening about these digital facts is that with Government services becoming ‘Digital by Default’ and assistive digital only being an add-on to assist, and eventually get all those who can go online, online, it means that for people such as Ron, and everyone else who has missed out the internet boom, the priority to work with them to help them, now has an agenda and ulterior motive. If they don’t start to use web technology, then they will be significantly disadvantaged and excluded from our countries ever-increasingly digital service landscape. ← Uk Statistics for Internet Use.